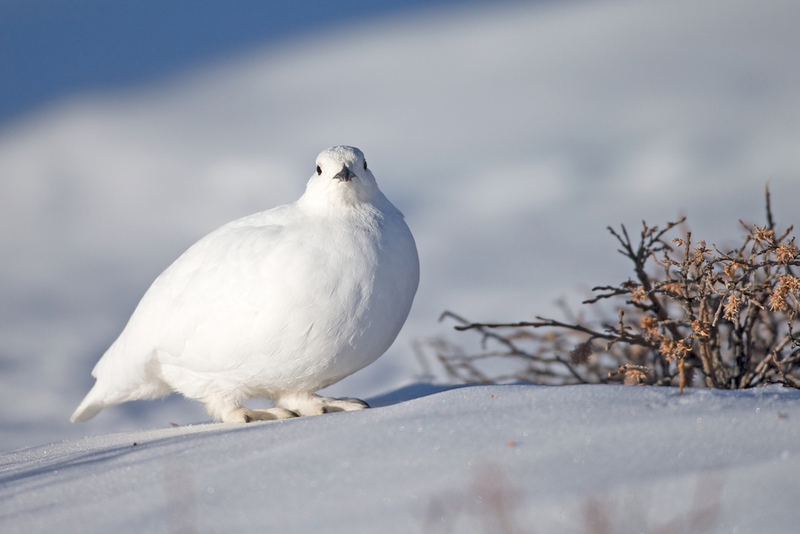 White-tailed Ptarmigan - a vision of blue-and-white in the first rays of early morning sun. WHITE-TAILED PTARMIGAN IS ONE OF MY FAVOURITE BIRDS and I have been lucky to have many great encounters with these beautiful high altitude grouse in Colorado's Rocky Mountains. Snowshoes tightened in the dark, I set off with my friend Pete Loncar on a long hike, intended to reach the ptarmigans just as the first morning rays of sun hit the snowy slopes where they spend the winter. On the way up we could see the tracks of Snowshoe Hares on the sides of the trail and eventually we were thrilled to see some of their makers as well, in their white winter coats. They were very timid and it was still quite dark before dawn. I am hoping that one day we will see something much bigger on this hike! We were lucky to have timed our arrival perfectly and as we arrived in the place to be, the sun was just popping over the mountain ridges to the east of us, lighting up the ptarmigans perfectly. We were careful not to disturb them too much even though they allowed very close approach, life is hard enough up here at 4000m ASL and we could watch them feeding on small willow buds, moving from one clump of bushes to another. In total 39 birds were scattered across a fairly small area, some taking shelter next to the tiny pine trees dotted amongst the willow bushes. This year marked the 25th anniversary of the first time I saw White-tailed Ptarmigans here, where did all the time go?